To make your store easily searchable in the Google search, you need to do Search Engine Optimization or SEO. If you implement SEO for your website, then people can easily find your website and video/audio content in the popular search engines like Google. There are two sections for which you need to set up SEO variables. 1. Dynamic Page 2. Static Page. 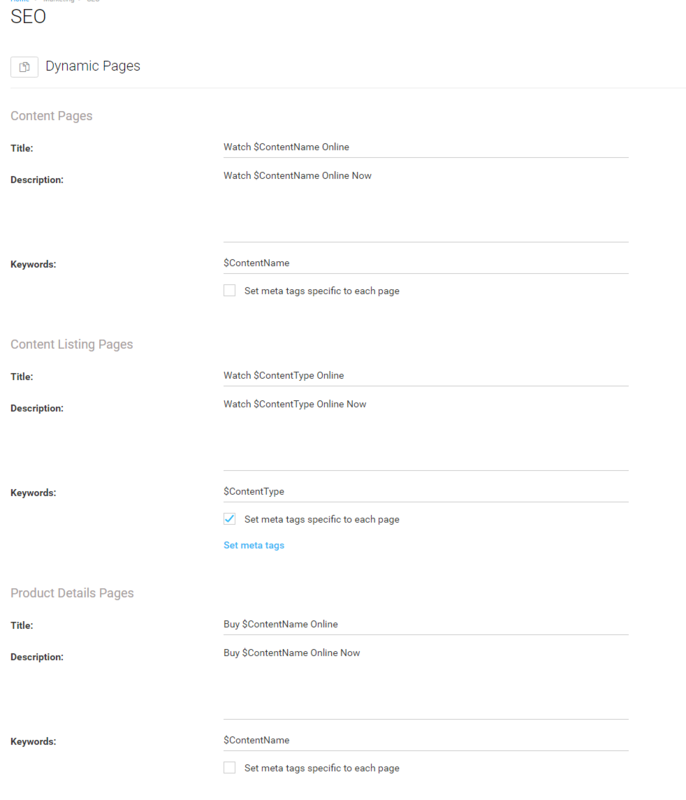 In the Dynamic Page section, you can set the SEO variables for “Content Pages”, “Content Listing Pages” and "Product Details Pages". (See Below Screenshot). In the Title field, the system variable "$ContentName" will take the content name as Meta Title by default. If you want to change the title then you can type a different title. Note: To set SEO variables for “Content Listing Pages” and "Product Details Pages" please follow the above mentioned procedure. In the “Content Type” section, select the content name from the drop down menu. Click on “Update” to update the Meta Tag information. 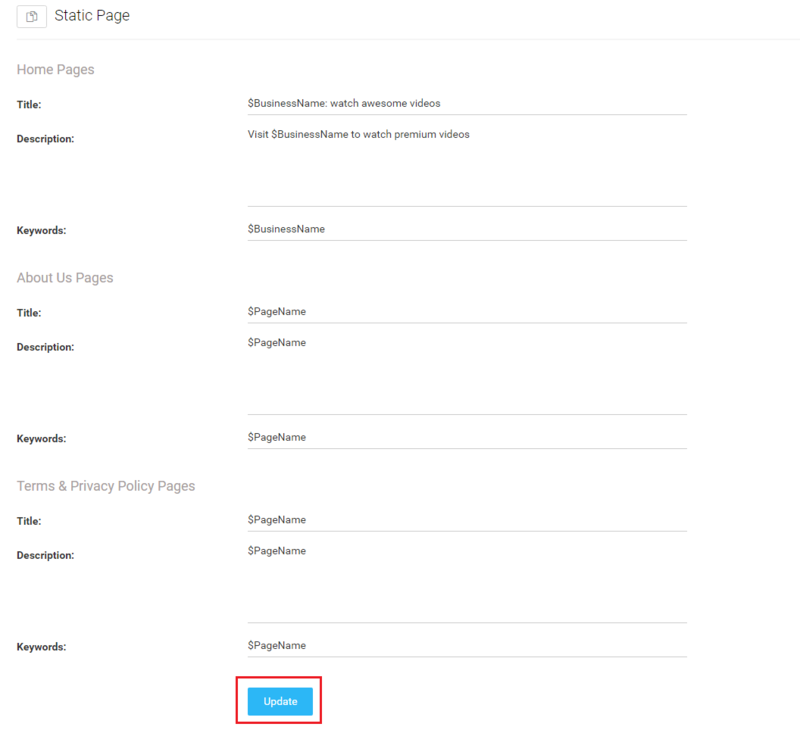 If you want to add Meta Tag for another content, then click on “Add More Content Type” and follow the above mentioned procedure. 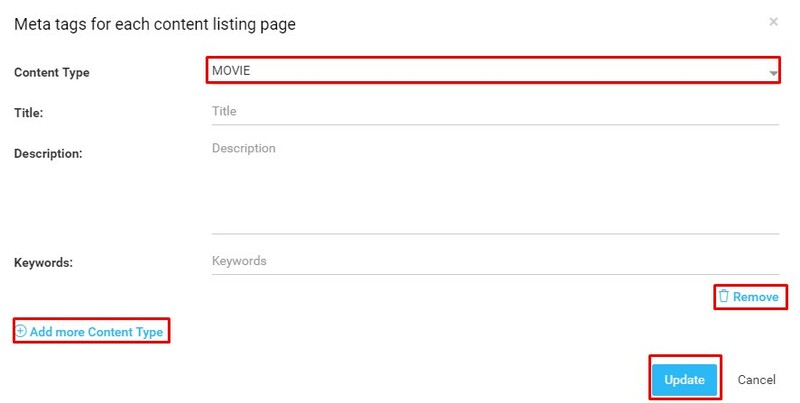 Note: Before adding Meta Tags for Content Listing page, you need to add the Content Categories to the Main Menu of your website. To know, how to add Content Categories to Main Menu please Click Here. In the “Keyword” field of the Home Page the system variable $BusinessNamewill pick the keyword by default. If you wish you can type keywords for the specific page. Click on “Update” to update the SEO variables for Home Page. To integrate Google Analytics to your website, please read our help article “Integrating Google Analytics to Website”.